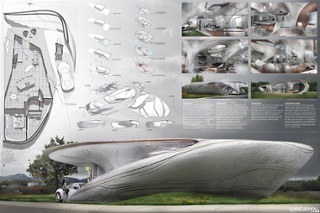 It is with great pleasure that we at Branch Technology announce the winners of the Freeform Home Design Challenge. The challenge convoked submissions from all over the world and of exceptional quality that surpassed our expectations. After thorough consideration and together with our internationally acclaimed Jury, we recognize the 1st Prize and Visionary Award whose extraordinary submissions best exemplify innovative home design using Cellular FabricationTM. In addition we give special appreciation to our followers and fellow enthusiasts that helped to recognize the winner of the People’s Choice Award. While the design competition commences, Branch Technology forges on with construction of the 1stPrize Winner’s design proposal. Should you be interested in continued involvement, be sure to follow us on Facebook and here on our blog. If you are interested in becoming a supply chain partner to help realize the First 3D Printed House, please get in touch.